Two colorful dragons oppose each other in this stunning Chinese wall fan. Two colorful dragons oppose each other in this stunning Chinese wall fan. In the middle of the dragons sits the pearl of wisdom, surrounded by fire. The dragon is the most powerful of all creatures in Chinese mythology and is also the most popular. The background of this dragon wall fan is plain white. Completely hand-painted, this fabulous fan will make a great addition to any wall in your home, office or business. You're looking at our 40 inch White Dragons Chinese wall fan. 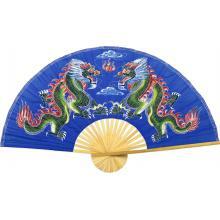 This fan is made of sturdy natural bamboo covered with a rayon fabric and it features two dragons opposing each other in the traditional Chinese style, with the fiery pearl of wisdom in the middle. The dragons were the seal of the Emperor's and to this day remain one of the most iconic figures in Chinese art and Asian art. And this fan is painted entirely by hand! The dragons there are absolutely stunning, colorful. And the brushstrokes are very detailed. This fan will make for amazing decoration on any wall in your home or business. There as we zoom in we can see the Dragons.